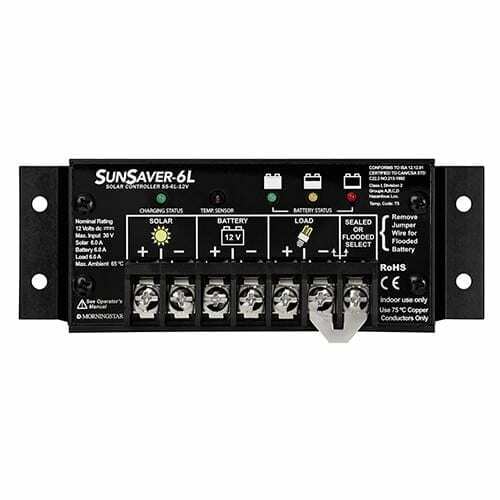 The Solar Charge Controller Morningstar Sunsaver SS-6L 12V is equipped with full electronic protections, 4-stage PWM battery charging, and self-diagnostics. It is the ideal controller for oil and gas, telecommunications, instrumentation, marine and boating, and solar home systems. Designed for harsh environments and easy to use installation, the SunSaver’s 100% solid state design has made it the industry’s highest reliability small controller. The Morningstar Sunsaver Duo is an advanced PWM two battery controller for caravans, boats and remote homes. It can charge two separate and isolated batteries at the same time. Morningstar Corporation is a world-leading supplier of solar charge controllers & inverters, with over 3 million units installed in over 112 countries. Morningstar’s products have been recognized in international solar markets as the most advanced and highest quality products available. For over 20 years, Morningstar has been a consistent and dependable partner: same ownership, same management and same strategy. The company is 100% focused on our core competence: solar power electronics. Most importantly, Morningstar is an employee-owned company. Join our ZERO Home Bills Community. Buy now the best solar charge controllers from the Best Brands at Best Retail Prices on ZEROhomebills.com by Solaranna.